There is much to be said about the abrupt changes and inconsistencies within a child's mind. In fact, one could say that no playground is as dynamic and fertile as that of a young imagination. While it may be hard for some folks to think that far back in their life, for others it will be instantly recognizable, identifiable and for some people, it will hit pretty close to home. 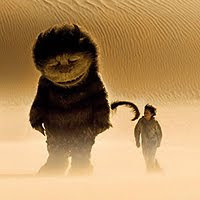 This, in essence, is what made me enjoy Where The Wild Things Are. If you are a jaded old soul, with no time for the foolishness of childhood, the random ramblings of a tall tale, or have never been hurt, physically or otherwise, during childhood horseplay, then maybe this just isn't for you. Otherwise, there is much to love about Spike Jonze's first foray into family friendly film. Any parents worried about their impressionable youth, however, might want to have the kids sit this one out. I'll explain. Max is a child dealing with a potentially agonizing portion of his life. His sister is too grown to care about making any time to play with or acknowledge him. His mother is still working, even when she gets home. He misses his father and now is thrust into having to deal with some new man in his mother's life. Beyond that, when his sister tells him to go play with his friends, you can clearly see there just aren't that many around. He also seems to be nearing the age where his imagination and zeal for playtime will no longer be welcome by others. He just might be getting a little too old for that wolf suit, and everyone else seems to know this but him. While some scenes of extended saccharine-infused horseplay and imaginary boasting may illicit a want to groan, they still all carry a completely authentic childishness that I've never seen on film before. When Max goes on and on about his special powers or the things he did as a king to the Vikings, he sounds like any little kid I've ever heard in my life. I mean this in a good way. The childhood banter is spot-on, and almost makes me think that Max Records (who just happens to be playing Max) was allowed to ad-lib some of these things. The sheer destructive force this kid has, however, didn't vibe with me entirely. While I'm not one to usually say that a film should or should not portray anything for the benefit of impressionable children, I can only wonder how many parents are going to take their kids to this movie, only to have to keep them from smashing stuff at home. For Max, the first recourse to his embitterment or anger is always destruction. Smashing things, breaking things, jumping on things, hitting things are his goto ways to take the rage out. I think, however, the reason he does this is because that may be all he has known. While he looks at a globe and other things his father gave him very fondly, there is an exchange between Carol and KW which leads me to believe that his father may have been abusive. KW tells Max that Carol goes too far and Max tells her that Carol is just scared and still loves her. While it may just be a completely imagined situation, there is definitely a position of Carol and KW as the father and mother figures, respectively. Whether or not Carol's physical rage is a manifestation of Max's own father is never really explained. Still, if they are dealing with these kinds of topics in a way that isn't heavy handed it will go over much better with the audience than just slapping you in the face with it repeatedly. Thankfully, much of the seriousness is also broken up by some very hilarious moments. It is taking place in child's mind, after all. What kid do you know wants to just be serious and sad all the time? People are definitely going to have their problems with this film. Sometimes the pacing seems off, and other times you're wondering where this is going to go. Each time I felt those things something happened to bring me back into the film. I also wound up reminding myself that this we are supposed to be bearing witness to the emotional dealings of a child. This kid has made up a fantasy world to try to handle the things he doesn't understand about his real-world life, and we're just peeking in. If it had a completely linear structure, made perfect sense all the time, and didn't have the possibility of annoying us like a hyperactive child could, it wouldn't feel genuine. I applaud Spike Jonze for not making this a child's film, but making it feel like you were directly in his head. Think of this as Being John Malkovich, with a 10 year-old subject, and you get more of an idea of where they were going with it. 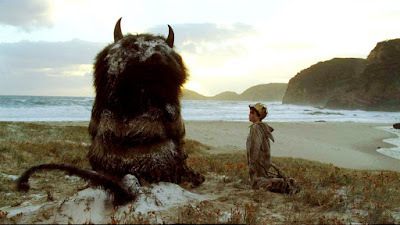 Where The Wild Things Are truly made me think back and remember what it was like to be a kid again. I haven't remembered what that felt like for quite some time, and the reality is that nostalgia only shows us the good parts. I hope the jaded, old souls can put down their batons of conventional adult thinking for a few dozen minutes and enjoy this film for what it is. I certainly went through it with a smile on my face and a bittersweet feeling in my gut, laughing a hell of a lot along the way. Maybe I can just relate with being a fat and hairy talking animal? Either way, we need to enjoy life as much as we can. Don't you know the sun is going to die?